The opening paragraph of the third book in The Gateway Chronicles may seem a bit mundane, but this story is anything but mundane. In The White Thread, we delve more into the prophecy of the six who are to rid the evil from Alitheia. As I'm re-reading this series (for a 3rd time! ), I'm purposely not looking at my past reviews until I sit down to write the current review. One of the reasons is because the series is being re-released this summer with updated editing and in some cases expanded or new scenes. So in a way, it is like reading it for the first time. 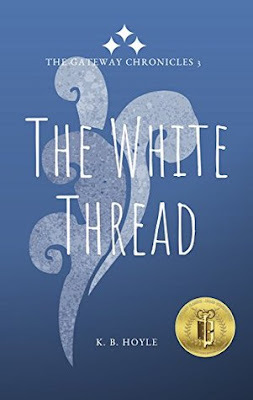 I mentioned in my first review of The White Thread back in 2011, that it wasn't my favorite book in the series. If pushed came to shove, that is still probably true, but I did enjoy it more this read through. Perhaps it was the changes Hoyle made. Since it has been 3 years since I read it, nothing jumped out as really obvious changes. That's good as the new bits flowed well with the original text. But I did feel different about the book - that I liked it more than I remembered. The Gateway Chronicles is a young adult series, so a bit of teenage silliness is expected but this new edition feels more mature in its tone, which as an adult reader I appreciate. I wonder if other places that I had felt were "over the top" were also toned down or if it is just the overall editing and clean-up of the manuscript. Either way, I'm loving this series even more this time around. 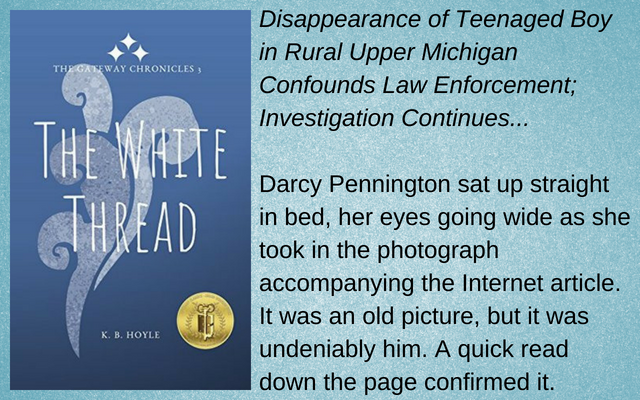 When I was reading this edition, I thought that Perry and Darcy's budding relationship was a little less and now being aware of the change in chapter two I think my suspicion is right. I almost laughed when it was mentioned they had been dating as they had barely held hands. While this relationship didn't get as much attention, another relationship did get a little more page time. I won't spoil it as I know many fans will be excited about this extra scene between two favorite characters. In my first review, I thought that the role this book plays in the series is to really lay out the puzzle pieces for the rest of the series. The Six and The Oracle were about introducing the characters and the world of Alitheia. The White Thread sets the stage for The Six and Tellius to fulfill the prophecy that brought them to Alitheia in the first place. Dean - I still think he is an invisible character. I actually thought at one point during The White Thread that I knew more about Banyard than I did Dean. K. B. Hoyle addressed this issue on her Facebook page and I was right that it is tied to his role as The Spy. But can't we know a bit more about him - his favorite food, best subject in school? Tellius - he is a bit more front and center in The White Thread. I bemoaned in my review two weeks ago that he was almost non-existent. We get to see more of him in this book. I'm not sure if it because I know what the future holds or because he is seen more in this edition, but I'm all Team Tellius. He's so sweet. I do have to say that I'm anxious for Darcy and Tellius to get on the same page, but I don't find myself yelling at them to 'grow up!' as I remember feeling the first time through. While I wait for The Enchanted to be ready I already want to go back and restart the series again. Alas, other review books need my attention. This looks like it might be good Donna; thanks for sharing. Thanks for sharing...I am now curious! And thanks for visiting my blog. Sounds good. I should look into this one more. This week I am featuring A Study in Death by Anna Lee Huber. Happy reading! This is a new-to-me series. Glad you're enjoying it! Well that opening got my attention and the fact that you are re-reading it again says this is a series that has a lot going for it. The beginning caught my attention, but the fact that you're reading the series for the 3rd time is enough to make me want to try it. If I had more time, I would probably have read this series more than 3 times. My niece has read it a dozen times or more. It is an interesting experience. After I finished this book the author asked if I noticed the new scene and I didn't. It has been 3 years since I read it. But I think I remember more about how books make me feel than actual details of the books. I kind of realized that when I was looking at my niece's reading list this summer. I remembered reading many of the books but not any of the real details of why it made me feel the way I did. Good intro. Since you are re-reading, it must be good. Hmmm interesting breakdown of your reactions (power to you; I can't imagine reading one book or series three times). Reading your post I wonder if I'm reading between the lines that the book/series was put out prematurely and that this version is the version that should have made it to publication in the first place. Or am I reading too deep? As a writer/editor, I'm still not sure about the book but I found this to be an interesting post. I've lost count of how many times I've read Harry Potter. And this series is just as good. I don't think it was a matter of premature release and the changes are quite small and undetectable. The first release was self-published, the second release was by a small press, and now the third release is again self-published. It's not unusual for there to be changes made when a book is re-released. None of the major plot points have changed. I remember a time when that kind of re-release was nearly unheard of. Was the opening paragraph changed? It's a good one. Thanks for this, I am really intrigued now. I generally don't read a book more than once, simply because my TBR pile is already so far out of control, that I just can't justify the time. It might also annoy me a little if I knew a book I had read, had been changed and updated, even though I appreciate that reading trends among the YA group, have matured and changed quite rapidly over the past few years. The opening paragraph is actually quite intriguing though. I re-read favorite series when I need a break from all my review copies. It's fun to try to spot changes, but so far I haven't been sucessful. Mostly it is because the changes don't change the plot.